American Pharaoh has achieved remarkable success in his short career. This American thoroughbred, owned by Ahmed Zayat and trained by Bob Baffert has won everything there is to win since being foaled in 2012. 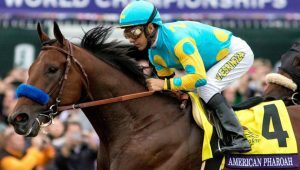 After 2014 wins in races such as the grade one Del Mar Futurity and FrontRunner Stakes, the following year was the year that would transform American Pharaoh into a legend of the sport. Starting with a Rebel Stakes win in March of 2015, and in the Arkansas Derby the following month, it was May when American Pharaoh took it to the next level with wins in the Kentucky Derby and Preakness Stakes – with a win in the Belmont Stakes coming soon after. These latter three races make up the Triple Crown of thoughbred racing, and in the history of the event, only 12 other horses have won all three races since 1919. In fact it had been almost three decades since a horse (Affirmed) had achieved this feat of excellence. American Pharaoh wasn’t done yet though and in the same year added the Breeder’s Cup Challenge to his CV. He now had the four most respected and prominent American races under his belt, an achievement known in its own right as the Grand Slam of Thoroughbred Racing. How many others have achieved this feat you may ask? None in the answer. The right trainer and of course jockey (Victor Espinoza) can of course make a difference, but innate ability must be the overriding factor. It’s no surprise then, with little else to achieve, American Pharaoh was put out to stud at the end of 2015. His career earnings were $8.5 million, a figure expected to be eclipsed by his stud fees. 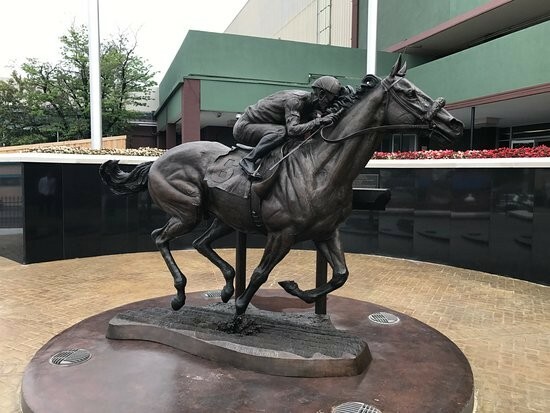 A life sized sculpture of American Pharaoh and his rider made by renowned sculptor James Peniston is installed at Oakland racetrack, the site of two of the horses early wins.